Hello my name is Jack Charles Wilkinson. I am currently in an Appalachian Studies course at Virginia Tech. I am happy to be in this course due to that fact that I am from Salem, Virginia. Salem is right in the heart of the Appalachian Mountains and I am very fond of the place I grew up. So learning about the area excites me a great deal. This blog is mainly going to consist of my thoughts on how the Appalachian region has kept some of it’s same traditions and customs and how over time things have changed. 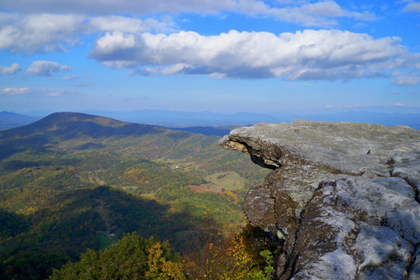 This is Mcafees Knob on the Appalachian Trail. The start of the hike up to it is about ten minutes from my house. This is just to give you an idea of where I live. I read an article the other day called Cherokee Accommodation and Persistence in the Southern Appalachians, by John R. Finger. In this article one quote really stuck out to me and it goes as follows, “Their presence and cultural persistence made the southern Appalachians a truly triracial society.” What this quote eludes to is the fact that when white people and black people started to move into the Appalachian region the Cherokee’s adapted to some of the others customs and the whites and blacks sort of learned from the Cherokees despite over taking there land. So after all that took place the region basically consisted of three types of people. I think that’s why now a days there is still so much diversity in the Appalachian region if you look as it as a whole. Ever since the white people came over here the area has been culturally diverse and it remains that way today. I wonder if today the location of different races in Appalachia has anything to do with whether how Mountainous the area is or not?? Article: Finger, John R. “Cherokee Accommodation and Persistence in the Southern Appalachians.” (n.d.): n. pag. Web. Author jcw62Posted on August 31, 2016 September 1, 2016 1 Comment on Greetings y’all!